The latest Milwaukee Bucks Daily is here as the wait for a D-League franchise may finally come to an end on Wednesday. Welcome back to Milwaukee Bucks Daily. If this is your first time joining us for the daily roundup, the idea of this piece is generally to help keep you up to date on the best of all the latest Bucks news on a day-to-day basis. This column acts as a means to recap what you might have missed from us at Behind The Buck Pass on the previous day, but also more importantly to share with you some of the work from around the internet that is worth your attention as a Bucks fan. As usual, if you spot something that you think might be of interest, you can send it our way too. Tweet it to @BehindTheBucks or mail it to winin6podcast@gmail.com. Milwaukee Bucks: What To Expect From Roy Hibbert, Spencer Hawes (read here): Ti Windisch took a closer look at the careers of Hibbert and Hawes to date in order to predict what we should expect from them as Bucks. Win In 6 Podcast #100: The Nature And Pitfalls of Fandom (read here): I was joined by Jordan Treske and Ti Windisch for the 100th episode of the Win In 6 Podcast to talk “what if” scenarios, the nature of fandom and much more. Announcement on Milwaukee Bucks’ D-League team coming Wednesday (read here): According to Action 2 News, the Bucks will make an official announcement in relation to their new D-League franchise on Wednesday in Oshkosh. Unless they’re playing a particularly cruel trick on the cities who have been involved in the bidding, it would seem likely that Oshkosh has beaten out Sheboygan and Racine for the right to host that team. Leading man: Giannis Antetokounmpo adjusts to added responsibilities (read here): Charles Gardner of the Milwaukee Journal Sentinel wrote about Giannis’ adjustment to more of a leadership role, including quotes from Giannis on the challenges he’s faced in that transition. Looking Back At Season Predictions (read here): Alex Boeder of Bucks.com looks back at his preseason predictions to see how the Bucks are measuring up to the perception of what their season would be. 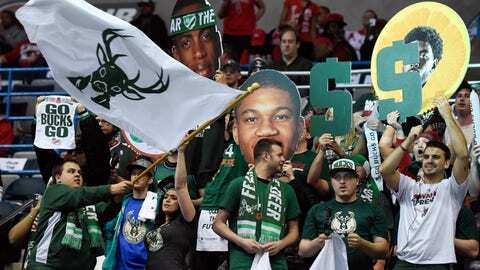 Milwaukee Bucks plan illuminated message board on new arena (read here): Rich Kirchen of the Milwaukee Business Journal has the details on an LED message board that will span the northwest entrance of the new arena. That’s it for today’s roundup but check back in tomorrow when we’ll do it all again.